Many a time, there are opportunities that I come upon me, and many a time I do not have the funds to jump at them. But when Dianne Lutz of Creatively Dyed Yarns came to my hometown of Virginia Beach, VA at The Yarn Club to give a class on dyeing and offer a chance to see her yarns up close and personal, I could not resist going. 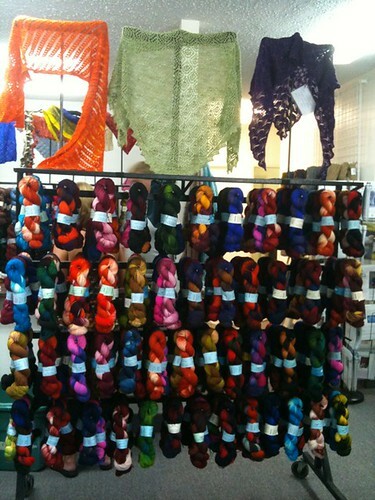 “The Yarn Club” is owned by the savvy Andrea Weisman Riddle and is located on 240 Mustang Trail, Suite 8, Virginia Beach, VA 23452 in the Lynnhaven area. Andrea noticed that in the many southside Tidewater shops, there was not one that catered to luxury yarn snobs like myself who also loved getting great customer service. Her fibery stock of Cascade and Berroco staples mixed with hand-dyed independents such as Dragonfly Fibers and Madelinetosh are big draws along with the Knit Picks Interchangeables, Chiao Goo Lace Red needles, pattern leaflets and magazines that she carries. 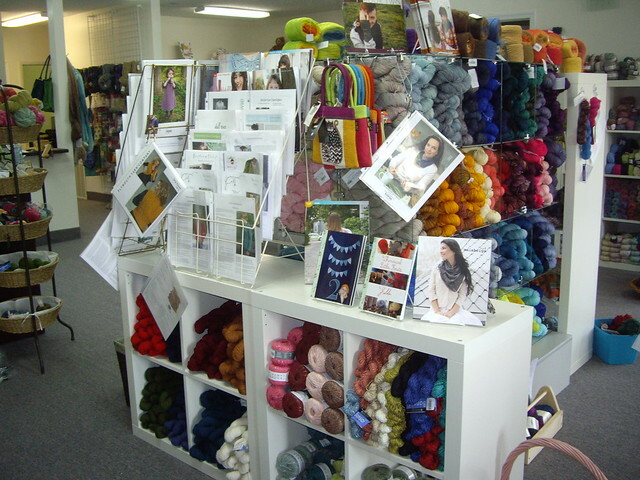 Add the openness of the shop (ever walk into a yarn shop and immediately feel claustrophobic because the walls of yarn overwhelm you?) plus her helpful staff, and you have a FABULOUS yarn shop. The best part of Andrea’s shop for me is how she constantly updates her customers on Facebook, Twitter, Ravelry and her website on what is happening in the shop. So when I heard Dianne was going to be teaching at one of my all-time favorite LYS, I just HAD to sign up for the class! If you have not seen Dianne’s work yet, be sure to visit her at one of these festivals. Her yarns are not only hand-dyed by herself, but offer enough variety that runs the gamut of hard-wearing soaker yarns, to cuddly sock yarns, to decadent silk ones. And one thing I do like about her sock yarns are the amounts of yarn she sells in each skein. With these larger skeins, there is no excuse to run out of yarn for a pair of socks! When I arrived at the shop, Dianne was in show mode. By “show mode” I mean delegating to get everything ready. 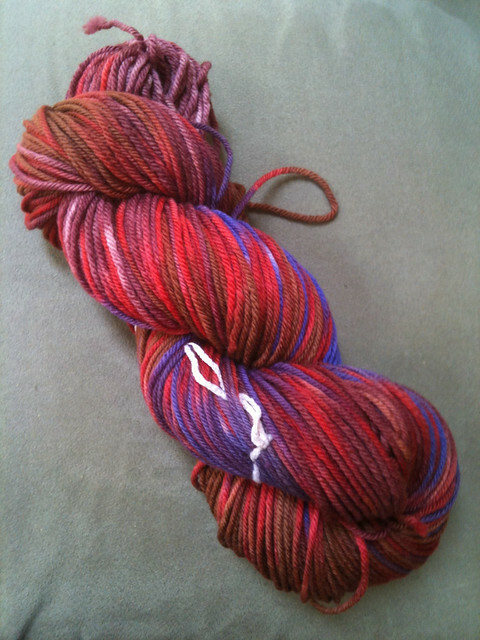 After everything was set up, the class began, and before I knew it… I made YARN. The skein I dyed is a 100% superwash merino worsted weight at 126 grams — enough for a hat and a pair of mitts, or one long skinny scarf. I choose magenta, brown, and purple as my main three colors, then used the red to blend everything together. I am absolutely in love with my creation, but in seeing how much work goes into making one individual skein of yarn, I hoppily leave the dyeing business to the professionals!